In the greater scheme of things it maybe a minor trophy but seeing you team at Wembley and lifting a trophy is never something to be taken lightly. The added benefit of also taking away the one trophy Southampton had won that we hadn’t! Transport was a nightmare, trains absolutely rammed full so Colin drove us to Horsham to try and get a train with some room on it which was a success. Poor first half with Sunderland deserved leaders but what a turn around second half with the introduction of Gareth Evans and Oliver Hawkins. We thought we had won it with Jamal Lowe’s late extra time goal but as we have seen so many times we cannot defend or kill off the last few minutes of a game and so we faced the trauma of penalties and all five takers hit the spot. 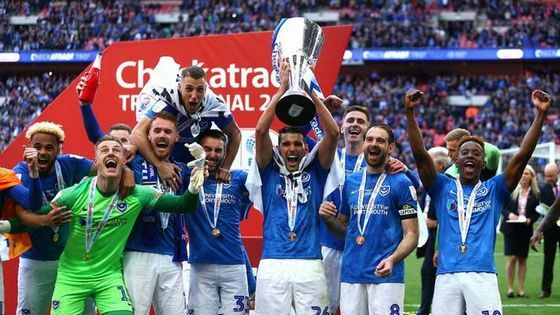 Pompey won the Checkatrade Trophy on penalties following a 2-2 draw with Sunderland at a packed Wembley Stadium. They were poor in the first half and an Aiden McGeady free-kick meant the Black Cats deservedly led at the interval. But the Blues were rejuvenated following the restart and Nathan Thompson levelled to ensure an additional 30 minutes. Jamal Lowe then struck to seemingly secure the win, only for McGeady to scramble the ball home at the death. That meant a dreaded shoot-out, but Pompey scored all of their spot-kicks, meaning that Craig MacGillivray’s save from Lee Cattermole allowed Oli Hawkins to fire home the winner. Kenny Jackett made one change from the side that won at Shrewsbury in the league the previous week. Ronan Curtis was fit enough to start after recovering from severing his finger, meaning that Gareth Evans dropped to the bench. The teams emerged to a vociferous atmosphere created by a packed crowd at the national stadium. Pompey’s contingent were whipped up by rousing pre-match speeches from former Fratton heroes David Norris and Hermann Hreidarsson. But it was the Black Cats who made the brighter start, with Thompson forced to clear George Honeyman’s teasing cross behind. Lee Brown then made a great challenge right in the corner to stop Lewis Morgan’s charge, as the side from the north-east looked threatening. Lowe tried his best to cause problems at the other end, although a ball into the box flew straight into Jon McLaughlin’s grasp. Sunderland were looking more likely to open the scoring and Matt Clarke threw himself in the path of McGeady’s strike. Pompey’s best opportunity came when Omar Bogle was felled on the right and Brown swung the ball into the mixer. Christian Burgess rose at the back post, but could not get enough power on his header to trouble McLaughlin. An effort from Morgan was deflected behind by Brown, while a key Clarke challenge halted Will Grigg’s charge. There was a rare shot for Pompey on 22 minutes, although Curtis’ effort was always swerving wide of the post. Then, after Tom Naylor had conceded a free-kick, the midfielder had to nod behind Grant Leadbitter’s delivery. Sunderland came close to breaking the deadlock soon after when the ball was only cleared as far as Morgan outside the box. The winger hit a fierce volley that flew through a sea of bodies, but MacGillivray got down well to push the ball clear. It was only a brief respite for the Blues, however, and they were undone after Thompson had conceded a foul. McGeady was brought down and picked himself up to curl the ball home, albeit with the help of a deflection off Clarke’s shoulder. Pompey tried to hit back after the break and when Bogle met a corner from Brown, his header was cleared from the line. It would not have counted, though, as referee Dean Whitestone had spotted a foul on Luke O’Nien in the build-up. The Blues were looking a lot brighter and trying to use Lowe as an outlet, but were still lacking a final ball. Jackett tried to shake things up on 56 minutes, with Curtis being brought off and replaced by Evans on the left. And it was a long pass from the newcomer that almost provided an equaliser just past the hour mark. The ball was nodded down by Lowe and Pitman took one touch before hitting a neat half-volley that struck the base of the post. Pompey were suddenly looking a real threat and when Sunderland failed to deal with another Evans delivery, Thompson was unable to find the target at the back post. Lowe then had a great opportunity following good work from Pitman, but rolled his shot wastefully past the post. Jackett made his second switch to the forward line on 69 minutes, as Bogle made way for Hawkins. The striker was soon having his shirt tugged inside the area, although Whitestone did not think it was enough to warrant a penalty. Evans then did well to hold off a challenge and burst forward, firing in a long-range strike that flashed past the post. But Pompey did find themselves level on 82 minute – and the goal came from a very unlikely source. THOMPSON had yet to score in 69 appearances, but certainly picked the right location to open his account, nodding home after Evans had collected the ball from Clarke and sent it into the box. The Blues contingent of an EFL Trophy record crowd of 85,021 erupted as the players ran towards them in celebration. It had been a dominant second half display, but Sunderland might have secured victory in stoppage-time when Denver Hume skipped through and sent a dangerous ball across the face of goal. There were, unsurprisingly, a few tired legs on display at Wembley as the extra period of 30 minutes got started. Pompey were still looking to get forward and Evans was tackled inside the box after playing a neat one-two with Brown. Lowe then screwed a shot wide after Hawkins had laid the ball off, while an angled effort from Brown was comfortable for McLaughlin. Following a brief break after the first set of 15 minutes, the Blues got straight back on the attack and Evans had a shot blocked after cutting in from the left. Jackett was forced to make a change when Ben Close limped off and his replacement almost scored within seconds of coming on. Anton Walkes received the ball on the edge of the box and his effort had to be clawed behind by McLaughlin. But Pompey did go ahead on 114 minutes and it was a brilliant finish from LOWE, who collected a long Clarke pass and sent a glorious lob over McLaughlin and into the net. The winger was booked for taking his shirt off in celebration, but it looked like being the decisive goal. Sunderland had other ideas, however, and in the dying seconds McGeady scrambled home an equaliser, despite the best efforts of Clarke to clear from the line. A penalty shoot-out is always a nervy occasion, but the Blues kept their nerve throughout, scoring all five of their spot-kicks. Evans, Pitman, Brown and Lowe all tucked away their efforts, while Sunderland’s second from Cattermole was saved by MacGillivray. It meant that Hawkins had the chance to win it for the Blues and he made no mistake, slotting the ball home to send the large travelling contingent home in joyous mood. Pitman then led his side up the Wembley steps to collect the Checkatrade Trophy and send those fans wild with delight. Conor Chaplin grabbed a late winner as Pompey fought from behind to beat Havant & Waterlooville at Westleigh Park. Alfie Pavey had fired the National League outfit ahead from the penalty spot, only for Nathan Thompson to find a quick leveller. And substitute Chaplin ensured the Blues would leave with a victory by taking his pre-season tally to three goals. Kenny Jackett fielded a different 11 in each half, as he had done at Cork earlier in the week. The Hawks fielded a raft of familiar names, including Paul Robinson – also employed as a coach at Fratton Park – Nicke Kabamba and Wes Fogden. The game started at a relatively leisurely pace, not surprising considering the scorching conditions. Recent Hawks signing Pavey attempted an audacious shot from 40 yards in the early stages, but the ball sailed over the crossbar. At the other end, a corner from Gareth Evans was only partially cleared and Tom Naylor drilled wide of the post. It looked like the deadlock would be broken on 11 minutes following a neat one-two between Ronan Curtis and Brett Pitman, only for a fine Jordan Rose challenge to deny the former. There were further half-chances for Evans and Lee Brown, as the Blues looked to move through the gears. Brian Stock might have opened the scoring for the hosts, however, sending the ball drifting over from just inside the Pompey half after MacGillivray had ventured from his box to head clear. But much of the action was taking place at the opposite end and the non-league side survived an almighty scramble inside their area. Instead the Hawks took the lead from the penalty spot on 30 minutes, with referee Dean Treleaven –after being instructed by his assistant – deciding that Matt Clarke had fouled Kabamba. It was Pavey who stepped up to take the spot-kick and he confidently sent MacGillivray the wrong way. Not that the Blues were behind for long, as THOMPSON strode into the box before arrowing a shot into the bottom corner. Pitman also had the ball in the back of the net before the break, although the skipper was denied by a linesman’s flag. Robinson then came to the Hawks’ rescue, making a vital block when Jamal Lowe turned Lee Brown’s delivery towards the target. For the second friendly in succession, Jack Whatmough was handed the captain’s armband for the second half side. Hawks then made their 11 changes a few minutes after the restart and it understandably affected the flow of the contest. Oli Hawkins almost headed Pompey into the lead when he met Dan Smith’s centre, only for Ryan Young’s fingertips to come to the Hawks’ rescue. His replacement Ben Dudzinski then made relatively comfortably stops to deny Ben Close and Conor Chaplin. It was the turn of the hosts to threaten on 68 minutes and Luke McGee got down well to keep out Alfie Rutherford’s drive. Whatmough soon showed why he played in defence, taking a swipe at thin air when Close picked him out unmarked in the box. And Dudzinski flung himself to the right to keep out Adam May’s fierce effort, with the visitors starting to dominate. Chaplin was next to try his luck after being teed-up by Close, launching a fine volleyed strike that fizzed narrowly past the post. And it was CHAPLIN who bagged the winner in the closing stages, steering the ball past Dudzinski’s grasp and into the bottom corner from the edge of the area. Pompey suffered a nightmare afternoon in Southend, with injuries and suspensions adding to a 3-1 defeat. Matt Clarke’s own-goal and a Jason Demetriou strike saw the hosts roar into an early lead at Roots Hall. Gareth Evans reduced the deficit before the break, only to pick up a knock and have to be withdrawn. Hopes of a comeback were then dashed in the second half, as Nathan Thompson was sent off before Brett Pitman also limped down the tunnel and Demetriou added a third for the Shrimpers. Kenny Jackett stuck with the same side that were narrowly beaten by Blackburn on home soil earlier in the week. And it looked to be a good decision as the visitors came flying out of the traps in the warm Essex sunshine. They should have broken the deadlock when Evans fed Conor Chaplin in the box, but the striker could only fire narrowly past the post. Instead it was Southend who took the lead against the run of play – and thanks to a large slice of fortune – on six minutes. Anton Walkes was caught in possession by Shayon Harrison and when Clarke tried to nick the ball from him, he could only succeed in burying the ball into the net. That saw the confidence levels switch, with Southend unsurprisingly lifted and the Blues looking stunned. The hosts soon capitalised on that by doubling their advantage, as Demetriou collected a pass from Stephen McLaughlin and lashed the ball home. They almost added a third goal moments later, but Dru Yearwood’s drive flew inches wide of Luke McGee’s post. It failed to dampen the spirits of the travelling fans packed into the North Stand, who kept backing their side. But they were not given much reward, as Pompey struggled to find any kind of fluency going forward. They managed to reduce the deficit on 36 minutes, however, thanks to good work from Jamal Lowe on the right. He sent in a teasing cross and Pitman was able to turn it back into the centre, where EVANS was waiting to bundle the ball over the line. Unfortunately, the winger got injured in the process of scoring and limped off to be replaced by Connor Ronan. There might have been a leveller in stoppage-time, but Pitman could not quite get on the end of another dangerous delivery from Lowe. It was Southend who had the final say of the first half, though, and Freddie Lapado should have done better than divert a free header straight at McGee. Chaplin had a speculative strike that only narrowly missed the target just after the action got back underway. A Southend break then looked concerning for the Blues, only for McLaughlin to over-hit a pass and the danger to subside. Lowe was looking lively at the other end of the pitch, but was unable to find the net from an acute angle after leaving his marker on the turf. It was the visitors now looking the more ambitious side, although they were struggling to test Mark Oxley in the Shrimpers goal. But Pompey’s task was made much tougher when Thompson caught Ben Coker with a late challenge on 64 minutes and was shown a straight red card by referee Lee Probert. It almost – and really should have – got worse for them, as Harrison glanced Michael Timlin’s cross wide from a few yards out. More bad news was just around the corner, though, with Pitman limping off to be replaced by Oli Hawkins. Southend came close to making their numerical advantage count when McGee failed to claim McLaughlin’s cross. But the keeper redeemed himself with a superb save using his legs from Simon Cox’s ferocious follow-up. Lowe was looking the biggest threat for the Blues and after twisting his way into space on the right, the winger’s cross somehow evaded everyone as it flew out of play. Southend wrapped up the points on 84 minutes, however, as Demetriou collected a pass from Yearwood and rolled the ball home. Pompey fell at the first hurdle in the Emirates FA Cup after a narrow defeat to high-flying League Two side Luton at Kenilworth Road. James Collins grabbed the only goal of the tie right at the end of a first half that the hosts just about shaded. But the Blues were much better after the break and were unfortunate not draw level on a number of occasions before Nathan Thompson’s late dismissal. Kenny Jackett made two changes from the side that were beaten by Bradford in the league the previous week. Kyle Bennett and Dion Donohue both dropped to the bench, with Oliver Hawkins and Brandon Haunstrup restored to the starting line-up. The first half was a niggly affair, with plenty of fouls to break up the play and little in the way of goalmouth action. Thompson was shown a yellow card for a late challenge on Alan Sheehan, while the reaction of Collins saw him join the defender in the book. It was the hosts who were first to threaten when Christian Burgess conceded a foul on the left, but Sheehan’s free-kick was just too high for Collins. Brett Pitman – still wearing a mask to protect his recently broken nose – had a fierce attempt at the other end and Hatters keeper Marek Stech did well to tip it over the bar. Stuart O’Keefe then fed Ben Close in the box, with Pelly-Ruddock Mpanzu coming across to make a vital block. The Luton midfielder was not quite so assured in attack, though, and his tame effort was comfortably held by Luke McGee. There was a scare when Andrew Shinnie disappeared into the visiting fans after straining to meet a cross on 34 minutes and a sigh of relief when he emerged unscathed. Hylton then failed to make the most of a decent opportunity by guiding Shinnie’s delivery straight at McGee. But the hosts did break the deadlock in stoppage-time, as Hylton teed-up Collins to lash a shot into the net. Pompey fans were fuming just after the restart when Jamal Lowe went to ground right in front of them and Seb Stockbridge declined to give a penalty. The referee then rubbed salt into the wound by deciding the winger had dived and brandishing a yellow card. Luton thought they had doubled their advantage when Hylton tapped home Jack Stacey’s low cross at the far post, but the linesman had his flag raised for offside. Luke Berry then drew a smart stop from McGee, with the ball looping up into the air and landing on the crossbar. But the woodwork soon came to the Hatters’ rescue, as Stech managed to divert Matt Clarke’s looping header against the bar. Pompey were suddenly looking dangerous with every attack and when Lowe met Matty Kennedy’s cut-back, his shot had to be hacked from the line by Sheehan. Pitman then met a long ball forward by Burgess, forcing Stech into action to make a save at his near post. That was the last bit of action for the Blues skipper, though, as he and Kennedy made way for Conor Chaplin and Bennett just past the hour mark. And Luton almost caught their opponents out when Haunstrup was caught dithering, only for Shinnie to fire wide with only McGee to beat. It was the visitors more eager to get forward, however, and when Stech kept out Close’s drilled effort, Chaplin fired the loose ball over. Pompey were desperately throwing men forward in search of a leveller, only to come up against solid Hatters resistance. And their task was made even harder when Thompson was dismissed for a second bookable offence following a foul on Collins down the left. Luton almost wrapped things up on the break, with Olly Lee not quite able to send his shot over McGee. But the Blues were not prepared to just sit back and only a fine save from Stech stopped Close from finding the bottom corner to secure a replay. Pompey have signed defender Nathan Thompson on a two-year deal. The 26-year-old will officially become a Blues player on July 1 when his contract with Swindon expires. Assistant manager Joe Gallen said: “It’s nice to get the first signing over the line and we’ve brought in a very talented and experienced League One performer. “We’ve got every confidence in Nathan that he’s going to do extremely well for Pompey. Thompson progressed through the ranks at the County Ground and made 187 appearances for the Robins. He was awarded his first professional contract in 2009, while his senior debut arrived in a victory over Torquay the following year. Thompson helped Swindon secure the League Two title in 2012 and skippered them to the League One play-off final in 2015. He can play at right-back or in the centre of defence, while he is also comfortable in a midfield role.